Transport Minister Phil Twyford and Mayor Phil Goff have joined Auckland Transport and NZ Transport Agency officials, Mana Whenua and the local community to mark the start of construction for the first stage of the busway between Panmure and Pakuranga. Photo supplied. 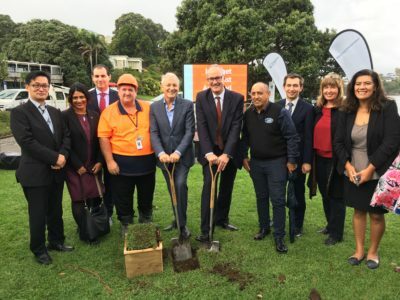 Transport Minister Phil Twyford and Mayor Phil Goff have joined Auckland Transport and NZ Transport Agency officials, Mana Whenua and the local community to mark the start of construction for the first stage of the busway between Panmure and Pakuranga. Goff says the $1.4b busway will bring congestion-free, high frequency buses to one of Auckland’s fastest growing areas. “The Eastern Busway is a game changer for east Auckland. It will significantly reduce journey times, ease congestion, provide local residents with a modern, reliable public transport system and unlock the economic potential of east Auckland. “Once complete, residents in Howick and Botany will see travel times by bus and train into the city slashed by up to a third and a separated cycleway will for the first time allow bike and scooter riders to travel around east Auckland safely. “The Eastern busway is transformational for Howick, Pakuranga, Botany and beyond. We’ve been able to speed-up its construction thanks to the regional fuel tax and I look forward to continuing to hit construction milestones earlier than would otherwise have been possible,” says Goff. Twyford says this project is a great example of central and local government working together through the 10-year Auckland Transport Alignment Project to unlock Auckland’s potential. “The work starting means we are another step closer to having a congestion-free network,” he says. “AMETI will connect the growing population of East Auckland into Auckland’s strategic transport network, providing better connections, faster journey times and more travel choices,” says the Transport Agency’s Director of Regional Relationships for the Upper North Island, Steve Mutton. The first stage will include turning Panmure roundabout into a safer, signalised intersection, construction of the busway along Lagoon Drive and Pakuranga Road, a new bridge across Tamaki River, shared cycling and walking paths, a new reserve at the end of Bridge Street in Panmure along with improvements for general traffic at key intersections. Major work will start at Easter at the roundabout with construction progressing along Lagoon Drive and Pakuranga Road over a two year period. Measures are being put in place to assist the travelling public during the construction phase, including additional express bus services between Howick, Pakuranga and Panmure Station, carrying out intensive work during periods of lower traffic volumes and ensuring that all traffic lanes will be maintained for the majority of work. Future stages of the Eastern Busway between Pakuranga and Botany, including the Reeves Road Flyover, are currently entering the consenting process and construction due to start in 2022. Meanwhile, Botany MP Jami-Lee Ross says he’s pleased to see construction is now under way on the first stage of the much-needed AMETI Eastern Busway. Ross was among the people on hand today for the first sod-turning on the $1.4 billion project, which will provide fast and efficient public transport between Pakuranga and Panmure. “I’ve supported this project since we first discussed it on the Manukau City Council in 2004,” Ross says. In 2013 Ross was part of the National Government that decided to advance a number of major Auckland transport projects, including the Eastern Busway. “We started to fast-track this project because East Auckland is well under-served by public transport. While it’s positive to see construction on the busway has begun, more needs to be done to ensure local commuters have access to high-quality public transport options, Ross says. “The logical next step is to create a rapid transit busway along Te Irirangi Drive that will help to form a connection between Auckland Airport and Flat Bush, Botany, and Howick. “It’s good to see the current Government carrying on with the work we started. “I will keep working with Transport Minister Phil Twyford on future public transport plans for our area.